Despite having given countless media interviews, Eunhyuk said he still feels nervous when he sits face to face with reporters. Looking causal with light makeup and huge glasses, Eunhyuk and Donghae of Super Junior D&E, a subunit of Super Junior formed in 2011 and named after the first letter of each member’s name, sat down with The Korea Herald to talk about their new album “‘Bout You” at the S.M. Entertainment Communication Center in Seoul on Monday. Although they appeared nervous at first, the two veteran singers eased the mood with their banter and laughter. “‘Bout You’ was originally planned to be released in winter, but we wanted to meet our fans as soon as possible. Our promotions used to take place mainly in Japan, so this time we wanted to showcase our music to fans in Korea,” Donghae said. The EP “‘Bout You,” the unit’s first release since “The Beat Goes On” in March 2015, is led by a lead track of the same title crafted by Donghae. The song veers away from Super Junior’s previous high-energy style and lands on the lighter side by venturing into the trap-hip-hop genre. Lyrically, it talks about a man’s far-fetched romance, explained the composer, who started making the song while serving in the military. Having completed his military service in July last year, Donghae said he spent a lot of time making a blueprint for the unit’s musical path while in the Army. “As you all know, there is plenty of time to reflect on oneself when in the military. I also spent a lot of time contemplating what kind of music I should do with Eunhyuk. We even exchanged handwritten letters to each other to talk about our next work when I was in the Army,” Donghae said. Eunhyuk also shared that he felt less burdened working with his longtime friend of the same age -- both 31 -- than preparing for Super Junior’s group album. Donghae and Eunhyuk, who met each other as 15-year-olds, looked back at how they met each other as the main dancers of the then-13-member group Super Junior in 2009. “Both of us haven’t changed much since we first met. He was like this innocent young boy who came from Mokpo. I think fans like this brother-like chemistry between us, with some fans even creating a fantasized plot in which we appear as a couple,” said Eunhyuk, laughing. Donghae said he plans to keep carving out a path for the group in the ever-growing K-pop scene, regardless of the members’ ages. “Just like with ‘Lo Siento,’ for which we flew over to Latin America and performed even before adjusting to the time difference, challenging something new is what Super Junior does. Regardless of our age, we will keep showing new sides of ourselves through good content, music and videos. We are actually preparing for another new project already,” Donghae said. 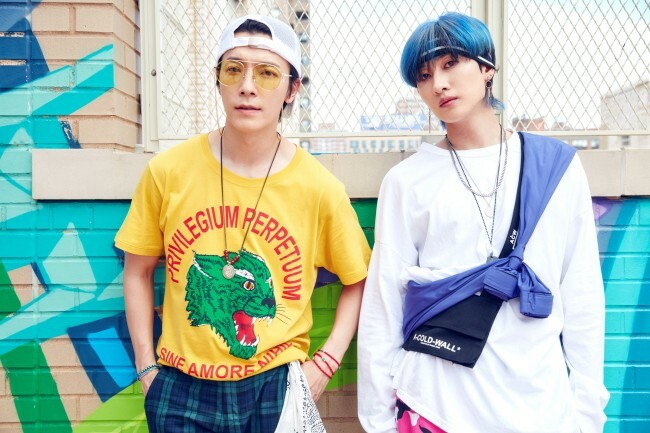 After promoting in Korea with the EP “‘Bout You,” which is slated for release on Thursday evening, Super Junior D&E will embark on its Japanese tour from Sept. 7 to Nov. 9.